Who will take over future jobs and welfare services in a shrinking Japan, immigrants or robots? 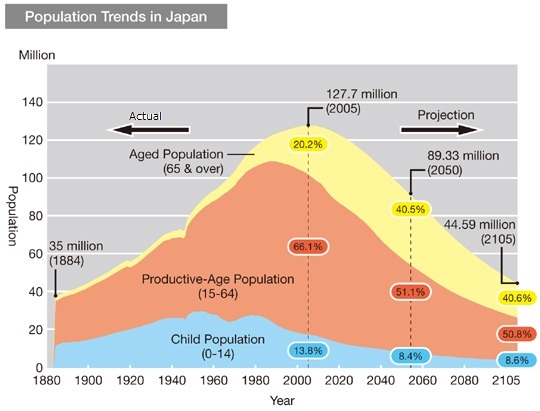 According to a projection of the overall size and the age breakdown of the future population in Japan of the National Institute of Population and Social Security Research, set up by the Ministry of Health, Labour and Welfare in 1996, the Japanese population will shrink over the next 100 years from 127,7 million people in 2005 to 44,59 million people in 2105. This projection is based on information from the Census, vital statistics, as well as research developed from various national representative surveys on population and social security problems conducted at the Institute. The trend toward an aging society with a decreasing birthrate is expected to accelerate. Trends also show changes in family composition (increases in nuclear families, households with elderly persons only, single-parent households), changes in employment structure (increase of employees), women’s social advancement, and urbanization of population. In light of these changes, social support for the elderly, families, persons with disability, and the unemployed is becoming increasingly important. The low birth rate there means foreign workers need to be recruited but there is a widespread opposition to immigration in the country as many Japanese value an ethnically homogenous society. On the question of how widely Japan should open its domestic labor market to foreign workers, former Prime Minister Junichiro Koizumi stated in 2005, “If [the foreign labor] exceeds a certain level, it is bound to cause a clash. It is necessary to consider measures to prevent it and then admit foreign workers as necessary. Just because there is a labor shortage does not mean we should readily allow [foreign workers] to come in. According to the Economist around 2 million foreigners live legally in Japan. The justice ministry counted 91,778 illegal residents in 2010, but the number, boosted by cheap Chinese labourers, may well be much higher. As an alternative to immigrant workers robots are expected to take over many industrial and welfare jobs. According to the Machine Industry Memorial Foundation robots could fill the jobs of 3.5 million people by 2025 , ranging from micro-sized capsules that detect lesions to high-tech vacuum cleaners. In the agriculture and forestry sector, 450,000 jobs could be held by robots if harvesting and pruning robots spread widely. In services such as cleaning and delivery, robots could do the jobs of 1.41 million people. Rather than each robot replacing one person, the foundation expects that robots could make time for people to focus on more important things. Japan could save 2.1 trillion yen ($21 billion) of elderly insurance payments in 2025 by using robots that monitor the health of older people, so they don’t have to rely on human nursing care. Japanese automobile companies Honda and Toyota are heavily investing in new robotics technology to develop intelligent machines that in the future can support industry and service sector in the human shrinking society. Japanese Toyota Motor Corporation (TMC) will present a new human support robot (HSR) prototype at the 39th International Home Care and Rehabilitation Exhibition 2012, at the Tokyo International Exhibition Center in Koto Ward, Tokyo, from September 26 through 28. The robot is aimed to assist independent home living for persons with limited arm or leg mobility. The prototype is an addition to the Toyota Partner Robot series and Assist Robot series that TMC is developing to assist people in their everyday activities.